Do you plan out where to put your scrapbook page journaling as you start a page? Or do you figure it out as you go? Or do you reach the end and say: “Yikes! I don’t have any room for my journaling?” I do all three. You’d think I’d get in a habit of some planning since I usually have a lot of journaling to include. Several scrapbook page ideas for your journaling follow. 1. Put your scrapbook journaling on a tag. Journaling on this scrapbook page sits on a bird-shaped tag. 2. Put your journaling on your background canvas or mat. A few lines of journaling sit on the orange mat holding the photo block, title, and other elements. 3. Put your journaling on photos. 4. Put your journaling on a piece of paper layered into your design. The journaling for this page is printed to an aged index card and layered in with the other elements. 5. Put your journaling on strips. Three strips hold the journaling for this page. They are placed with right justification and small ornaments anchoring each. 6. Put your journaling on extended photo mats. 7. Put your journaling along the edge of and around other photos & elements. 8. Place your scrapbook page journaling to create a border. The journaling here runs around the page canvas. 9. Hide your scrapbook page journaling. Some journaling is presented on the tag tucked into a folded piece of paper which includes even more (hidden) journaling — see the image below for the fold-out. 10. Put your scrapbook page journaling anywhere you can! On this page, I had so many details of my own plus reports from the news that I wanted to include that I ended up filling up several blocks on the layout with my journaling. Don’t miss the opportunity to delve into all things to do with scrapbook page journaling. 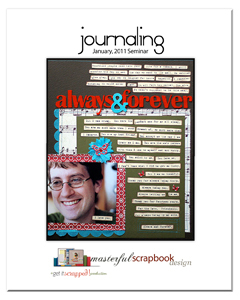 In January, 2011, the Masterful Scrapbook Design Series focuses on scrapbook page journaling — learn how to develop your content, hone your writing skills and make your journaling an integral part of your page design with teachers Lain Ehmann, Paula Gilarde, Karen Grunberg, and Dina Wakley. I have this same problem too.I deeiintfly can’t just keep them on my computer to look at…I *have* to have them physically in my hands somehow – but yeah, photo albums or photo BOOKS? They both have their pros and cons. I think I’m leaning towards photo books (provided I can get good deals on them through things like groupon coupons!) but then again, I don’t write dates and names on the backs of my photos like you do.Although part of me wants to keep at least SOME things “old fashioned”…so actually having photos in photo albums might be hard to give up.Oh the dilemma!! !